Access Budget Safaris limited is a Ugandan safari tour and travel company with its operational head office in Uganda Kampala with the certificate of incorporation No. 162148. The team runs the day-to-day activities of Access Budget Safaris, has the experience in Uganda tourism as far as Uganda safaris is concern, our tour guides with great ideas since they have been handling wide number of tourists from all over the world they are here for you too, We design each safari package to suit either be a group or individuals depending on the budget and the time scheduled for your visit. our aim is providing high-quality tours and safaris at a budget price for both private and group tours. Your satisfaction is Access budget number one priority so we are ready to guide you to discover the Pearl of Africa while in Uganda and other great lakes countries. To budget yet memorable holidays, tours and guiding services, to our clients while building the best tourism delivery channels in the great lakes region and later the whole of the African continent. CEO And In Charge Company Welfare Jessica CEO 0f Access Budget Safaris. Born and raised in western Uganda. She is a God fearing and honest leader. She registered and opened the doors of Access Budget Safaris in 2013, and since then, the company has grown to greater heights. MD Field Consultant He is responsible for communication, tour consultant and dealing with reservation. He is passionate about wildlife tourism and eco-tourism, tourism attraction & Culture. He will be your preferred consultant for your adventure! In Charge Information Technology She has a strong ICT background supported with a degree in Computer Science from Makerere University. she and her team have been very supportive mainly in the information technology department at Access Budget Safaris. He has got the best guiding skills in this field and has good years of experience which makes him the best guide ever. he has traveled the whole of East Africa as well as its tourist destinations which makes him an asset to Access Budget Safaris. 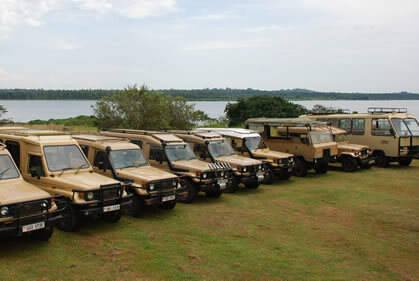 We also provide land cruisers, coaches, minibusses to our clients on specific safaris. Our vehicles are fitted with seat belts, serviced regularly, with a professional driver- guides. We make it extraordinary moments (Trips) possible are the handpicked tour guides who are experts in all national parks of Uganda, Rwanda and the Democratic Republic of Congo. Access Budget Safaris guides are chosen for their absolute dedication to interpreting those wonders that make every place unique. Intelligent, knowledgeable and supremely organized, our guides oversee every detail of your itinerary and are a vital part of your safari. Why Opt for Access Budget Safaris? Access Budget Safaris is an adventure travel pioneer offering the pearl of Africas's most awe-inspiring selection of affordable small-group tours, safaris, and expeditions. Our trips embrace authentic accommodation, exotic cuisine and local transport to put travelers on a first-name basis with Africa’s people, cultures, landscapes, and wildlife Safaris. We are aware of the critical role of a guide to our guest’s holiday experience, we hire only the best. These are highly experienced and are knowledgeable of the flora and fauna, history, culture, geography. These also attend regular courses with the accrediting local USAGA- which is Uganda Safari Guides Association. We also provide Germany, Spanish and Japanese speaking Tour Leader/Guides, as well as accompanying translators in any of the other major international languages upon request.